Join 'The Rainbow Experiment' for its Arizona premiere on Saturday, September 15, 2018 at The Screening Room in Tucson, Arizona as a part of the Arizona Underground Film Festival! 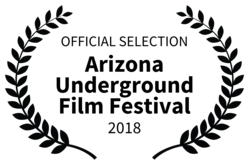 Join 'The Rainbow Experiment' for its Arizona premiere on Saturday, September 15, 2018 at The Screening Room in Tucson, Arizona as a part of the Arizona Underground Film Festival! For tickets click here. Producer Allison Vanore last screened at the AZUFF with feature 'Love in the Time of Monsters' in 2013. Allison attended the University of Arizona so bringing films back to the city is always a pleasure. Fun Fact: As a part of her course work Allison also worked as a projectionist at The Screening Room during the Arizona International Film Festival. "Junkyard" producer, Allison Vanore, and writer/director, Michael Skvarla, traveled to Tucson, Arizona this October for the screening of their short film during the 2009 Tucson Film & Music Festival. Visit the festival online at Tucson Film and Music Festival. This year's line up includes several films by Media Arts alumni includng Allison Vanore, Keith Ozar, Chelsea Cole and Michael Toubassi. In collaboration with Upstairs Film and the Tucson Film Office. “Junkyard” will be screening as a part of the shorts section at the Crossroads Cinema on Swan and Grant, on Saturday, October 10th at 1:30pm.